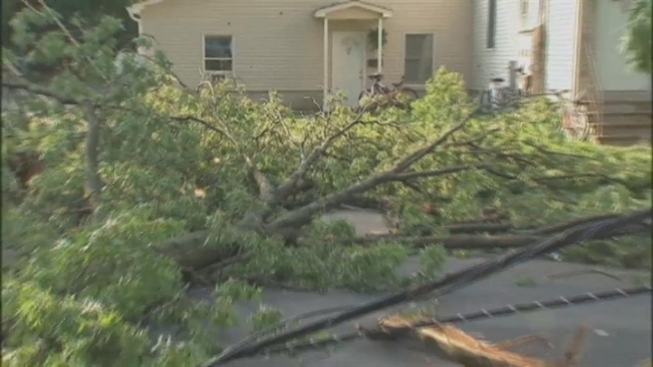 Thousands of utility customers in central New Jersey remained without power Sunday afternoon after a series of severe storms moved through the region. The first wave of storms, which contained lightning and heavy rains, knocked out power to about 30,000 customers on Saturday afternoon. And thousands more lost their service when more severe thunderstorms hit late Saturday night, knocking down numerous trees and power lines. As of Sunday evening, Jersey Central Power and Light said nearly 4,400 customers in Monmouth County were still without electricity, though most customers were expected to have their service restored by sometime Sunday night. In Freehold Township, where power outages persist, a state of emergency was declared. A curfew will remain in place from dusk till dawn for Freehold residents until power has been restored. The storms also damaged several tents and the grounds at the Monmouth County Fair in Freehold, forcing officials to cancel the fair's final day of events.